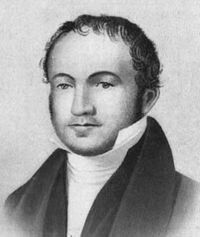 Although it is commonly believed the entire Carolina Piedmont was densely forested prior to the coming of Europeans, the region actually included large expanses of native Piedmont Prairie, especially within 100 km of present-day Charlotte NC. Such grassy savannas--open plains dotted with occasional trees and shrubs--contained many plants similar to but distinct from flora found in the tallgrass and shortgrass prairies of the midwestern United States. 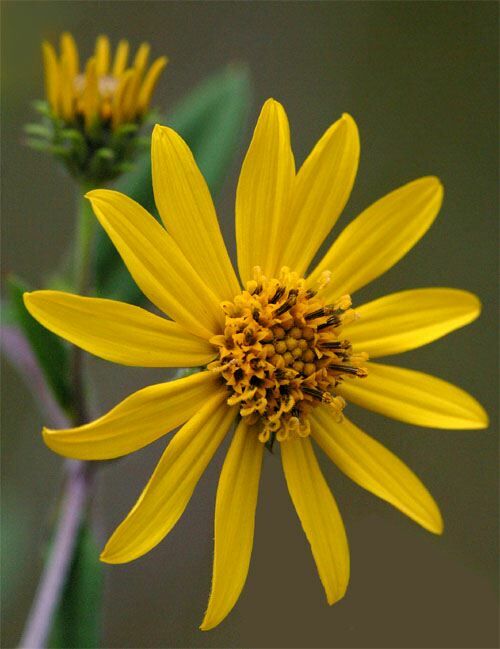 One Piedmont prairie species--Schweinitz's Sunflower, Helianthus schweinitzii (above)--is a perennial wildflower that persists today in a very few prairie remnants and along utility and highway rights-of-way. 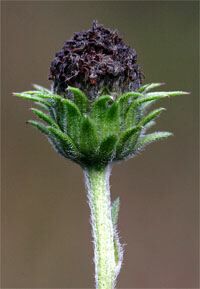 There are only about 90 known populations, many containing less than 40 plants each. 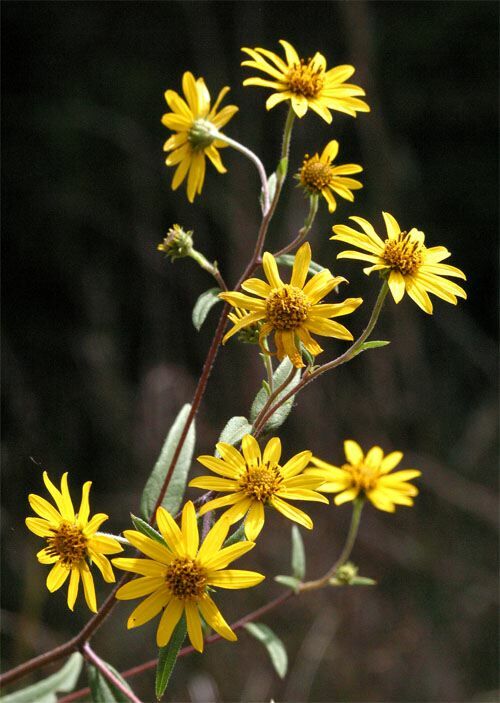 Because of its scarcity, Schweinitz's Sunflower has been placed on the Endangered Species List and is fully protected by state and federal laws. 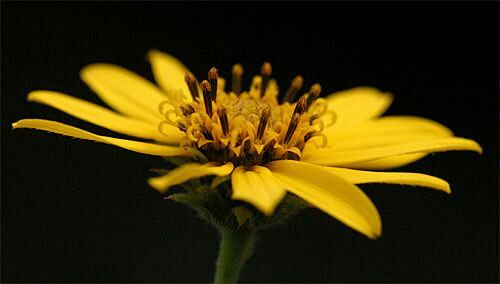 To keep Schweinitz's Sunflower from becoming extinct, several conservation groups, government agencies, and individuals explore likely habitats to find and protect local populations of the plant. Sometimes seeds are collected in autumn and sown the next spring in appropriate nearby locations. 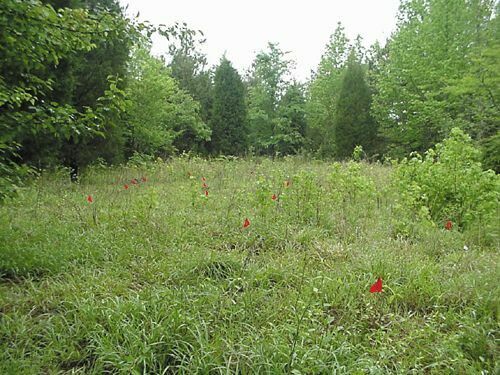 Workers are also reclaiming new-growth woodlands and restoring them as prairie habitats in which the sunflower can be re-established. Still other folks monitor existing sunflower populations and move them if threatened by mowing, road construction, or other development. Hilton Pond Center for Piedmont Natural History became part of the education efforts of the Schweinitz's Sunflower Recovery Program when it received 30 sunflower roots of various sizes--some quite small--from Dr. Richard Houk, a retired botany professor from Winthrop University who is a noted authority on Schweinitz's Sunflower. Dr. Houk collected these roots (see two photos above) from a site along a York County highway not far from the Center. On 3 May 2002, staff from Hilton Pond Center dug shallow holes and planted the sunflower roots in a meadow-like area maintained until the mid-1990's by occasional early spring burning and now kept open by biannual light mowing in winter (see photo below, in which plantings are marked with red flags). It was anticipated the sunflowers would thrive in this "artificial prairie" and develop into a protected population with its own genetic diversity. Unfortunately, the initial effort met with disaster when White-tailed Deer apparently entered the meadow within a few days after the sunflowers were transplanted. As far as we could determined, deer pawed up the loose soil, ate nearly all the tuberous roots, and decimated the sunflower plantings. 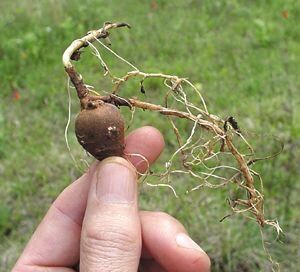 If additional roots are planted at the Center, they will be covered by wire mesh to deter deer or other foraging animals. A few roots remained and were watched closely throughout the remainder of 2002. 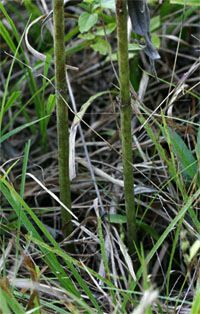 Although some vegetative growth did occur that year and in the one following, no blooms were produced until mid-September 2004 when Hilton Pond Center staff were elated--and relieved--to finally find a single seven-foot-tall stalk bearing more than 15 flower heads. Since these blossoms were attracting pollinators such as wasps, beetles, and small bees, it was anticipated they eventually would set seed and help expand the local population. Curiously, our one remining plant did not appear in 2005 and we feared it, too, had been destroyed by deer or other herbivores. 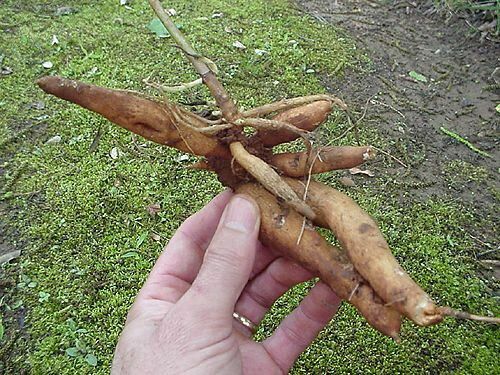 Then, in fall 2006, we discovered the original tuber had given rise to TWO flower stalks (above left), both of which bore blooms into October. 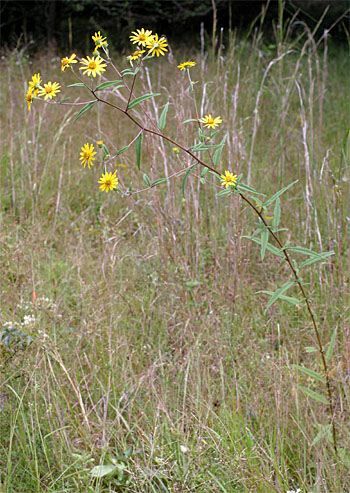 We were concerned when the plant did not flower in 2008 because deer browsed its foliage to the ground but were pleased in autumn 2009 after the rhizome produced SIX vertical stems. Populations are also endangered by residential and commercial development, and by invasive exotic plants such as Chinese Privet (Ligustrum sinensis), Russian Olive (Eleagnus angustifolia), Japanese Honeysuckle (Lonicera japonica), Kudzu (Pueraria montana lobata), etc. 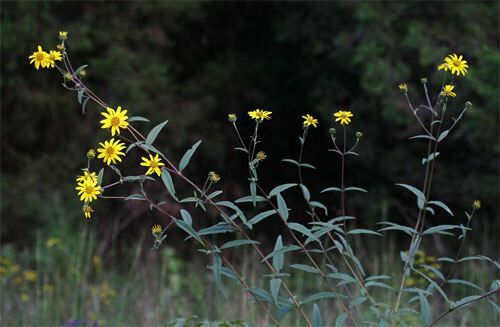 Schweinitz's Sunflower requires some degree of disturbance--provided historically in Piedmont Prairies by fire and/or native grazing animals such as Elk and American Bison that maintained open habitat; however, repeated mowing during the flowering and fruiting season further endangers the species, particularly plants growing along highway shoulders. Even greater danger comes from indiscriminate spraying of herbicides by power, phone, cable, and highway personnel because toxic chemicals kill not only foliage but the all-important roots.